Worldwide, dryland salinity is a major limitation to crop production. Breeding for salinity tolerance could be an effective way of improving yield and yield stability on saline-sodic soils of dryland agriculture. However, this requires a good understanding of inheritance of this quantitative trait. 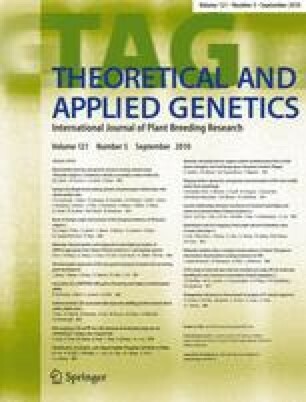 In the present study, a doubled-haploid bread wheat population (Berkut/Krichauff) was grown in supported hydroponics to identify quantitative trait loci (QTL) associated with salinity tolerance traits commonly reported in the literature (leaf symptoms, tiller number, seedling biomass, chlorophyll content, and shoot Na+ and K+ concentrations), understand the relationships amongst these traits, and determine their genetic value for marker-assisted selection. There was considerable segregation within the population for all traits measured. With a genetic map of 527 SSR-, DArT- and gene-based markers, a total of 40 QTL were detected for all seven traits. For the first time in a cereal species, a QTL interval for Na+ exclusion (wPt-3114-wmc170) was associated with an increase (10%) in seedling biomass. Of the five QTL identified for Na+ exclusion, two were co-located with seedling biomass (2A and 6A). The 2A QTL appears to coincide with the previously reported Na+ exclusion locus in durum wheat that hosts one active HKT1;4 (Nax1) and one inactive HKT1;4 gene. Using these sequences as template for primer design enabled mapping of at least three HKT1;4 genes onto chromosome 2AL in bread wheat, suggesting that bread wheat carries more HKT1;4 gene family members than durum wheat. However, the combined effects of all Na+ exclusion loci only accounted for 18% of the variation in seedling biomass under salinity stress indicating that there were other mechanisms of salinity tolerance operative at the seedling stage in this population. Na+ and K+ accumulation appear under separate genetic control. The molecular markers wmc170 (2A) and cfd080 (6A) are expected to facilitate breeding for salinity tolerance in bread wheat, the latter being associated with seedling vigour. The online version of this article (doi: 10.1007/s00122-010-1357-y) contains supplementary material, which is available to authorized users. We thank Mr. Robin Hosking (Australian Centre for Plant Functional Genomics) for his construction and creative modification of the supported hydroponic system and technical support throughout this project, Mr. David Keetch (The University of Adelaide) for his help with the supported hydroponic experiments, and Mrs. Teresa Fowles and Mr. Lyndon Palmer (The University of Adelaide) for their help with the elemental analyses, Mrs. Kerrie Willsmore and Dr. Kevin Williams (South Australian Research and Development Institute) for the initial construction of the map, Dr. Neil Coombes for designing the experiments (Department of Primary Industries, New South Wales, Australia), and, editor and anonymous reviewers for their constructive comments on this manuscript. This work was supported by the Molecular Plant Breeding Cooperative Research Centre, South Australian Research and Development Institute, The Grains Research and Development Corporation, Australian Centre for Plant Functional Genomics, and The University of Adelaide, Australia.